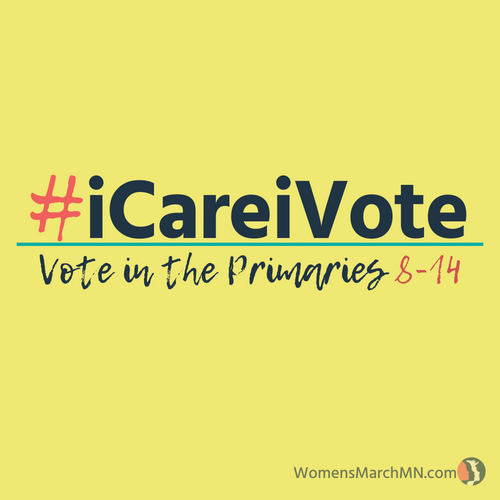 Act Now-Women's March Minnesota-Vote in the Primary Election. Vote early. Vote in the Primary Election. Vote early. This November, Minnesota will go to the polls to elect federal, state, county and local officials in what could be one of the most important general elections of our lifetime. Your first chance to help chart the course for change in Minnesota, however, is RIGHT NOW in the primary elections. Vote Early – Vote Absentee! Office of the Minnesota Secretary of State. Why are primary elections important? Primaries determine who will be on the ballot in the general election. Now is when you can make sure there will be candidates on the November ballot who represent your values. Primary Election Day is Aug 14th, and early voting is open now through August 13. We are asking the Women’s March Minnesota community to vote early. Early voting is voting! Do you have other questions about voting in the Primaries or the general election - eligibility, how, when, where? The Secretary of State’s Office can help you get started. Check out their section on who can vote and how to register. Another excellent resource is the League of Women Voters. To make sure all members of our community are able to vote, in special situations voting assistance is available. An agent working on the voter’s behalf can pick up and return an absentee ballot for the voter. This is called ‘agent delivery.’ To qualify for agent delivery, the voter must live in a nursing home, assisted living facility, residential treatment center, group home or a battered women's shelter. The voter might also be hospitalized or unable to go to the polling place due to incapacitating health reasons or a disability. Six Actions to take this week! Find out who’s on your ballot for the Primary elections and research your candidates online. You can also find their website and view advocacy groups ratings of the candidates. Vote during the early voting period – through Aug 13th. Help others register to vote. Text P2P to RTVOTE (788-683) to make sure you and our friends and family are registered to vote! Sign up to door-knock for candidates you care about. Remind your friends to vote in the Primary Election.